A few weeks back we started a discussion on random width floors and whether or not they are limited to a certain set of design styles. Then earlier this week I posted a link to an article I wrote about environmentally friendly flooring specifications which mentioned the green aspects of random width floors. To wrap it up, I thought I’d have some of our contributors comment on what they are seeing in terms of random width floors currently in the marketplace. 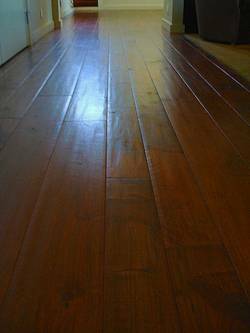 Jim Oliver from Oxnard, CA based Plantation Hardwood Floors notes that random width floors are a “design element that hearkens back to an earlier time when wood flooring was built from randomly sawn logs”. In these days the function of the floor and the meticulous use of as much of the material as possible determined the look rather than an aesthetic desire. Jim adds “for this reason most modern specs for random width floors are frequently for more ‘rustic’ specifications, in keeping with a presumed ‘old world’ look.” For most random width requests, Jim says the most typical width groupings they are asked for are 3″-5″-7″, 4″-6″-10″ and 3″-4″-6″. However Jim notes that random width floors are also sometimes specified in two widths like 5″-7″ or 3″-5″. 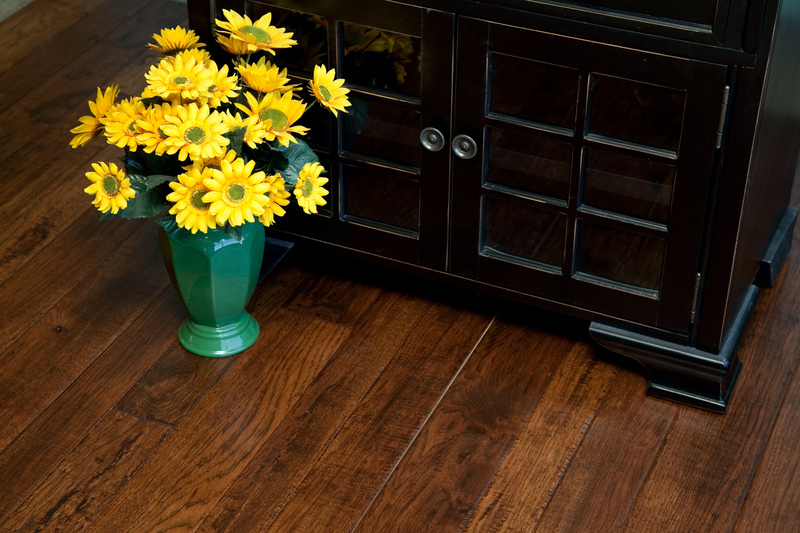 Jim sums up by saying “The use of the random width wood floor creates a very customized look, for two reasons: one, it is distinctive, and two, it is not usually available from pre-made, commodity flooring sources”. Rick Merwin from Costa Mesa based Fontenay has produced his share of random width floors in a variety of species and widths. “We typically see two types of random width floors. We define them as a mixed width pattern or a ‘flop’. Mixed width patterns are typically three widths, sometimes four and there is generally a inch or two difference in the planks used. A ‘flop’ is where we incorporate up to five widths and we don’t install them in a pattern they are randomly used throughout the installation. In my opinion these are the best looking random width floors” Rick adds. Merwin notes that in terms of the design elements they typically see these floors go into Santa Barbaran, California Tuscan or Spanish Revival settings where high ceilings and large spaces are being filled. Whereas the majority of random width floors are custom made to fit each specification, there are more and more products creeping into production. Our company launched last year a product called Chalet that incorporates 3 1/4″, 4″ and 5″ widths mixed evenly in each box. This product has been welcomed in the Midwest and we are currently expanding the color range of the product to meet increased demand.